I cleaned up my worktable today. It was the last step in a workroom cleanup that I’ve been tackling for several weeks. I haven’t been able to sit at the worktable for months. Earlier in the week I’d been hit with a passion for starting a new oil painting. I’d abandoned a large stretched canvas a year ago, and suddenly I had an idea for what to do with it. I covered over what I’d begun before by laying in an undercoating of misty colors for an abstract garden painting. With that done, my passion for painting had barely been tapped, so I put up my portable easel, jury-rigged a large canvas on it, and began a morning glory painting. Still unfulfilled, I set up the table easel and under-painted yet another. Two days later, none of my canvases were dry enough to continue painting, so I forced myself to make a shift in focus. I’d begun a small still life several months earlier. It was a painting I was attempting to create according to the rules — not a method that comes easily to me. I was itching to paint freestyle. But still, I thought, working on the little painting would satisfy my desire to be painting. However, I needed a place to work on it. The time had come to tackle the final clean-up job. At one end of my long worktable was a tall jumble of accumulated stuff. The pile had started long ago with a manila folder labeled “things to file” — a folder long since buried by other things to file, things that didn’t have a home yet, or things I wanted to keep handy. One bonus for not filing things away for a long time is that when you finally get to it, many of those items can be thrown away. Another reward is that the job one imagines will be tedious and boring (which is why my pile accumulated for so long) turns out instead, to be an adventure, a search through buried treasure. Like a shopping list clipped to the fridge and penciled in over the week, my pile of visual and physical things had allowed me to drop the items from my short-term memory. This sorting through photographs, inkjet prints of subjects I wanted to paint, sketches, puzzle designs, photographs, newspaper clippings, auction and gallery opportunities, and notes from buyers, became a journey through my creative activities over the last four years. (Yes indeed — in that manila folder, when I finally unburied it, were sales invoices from 2004.) 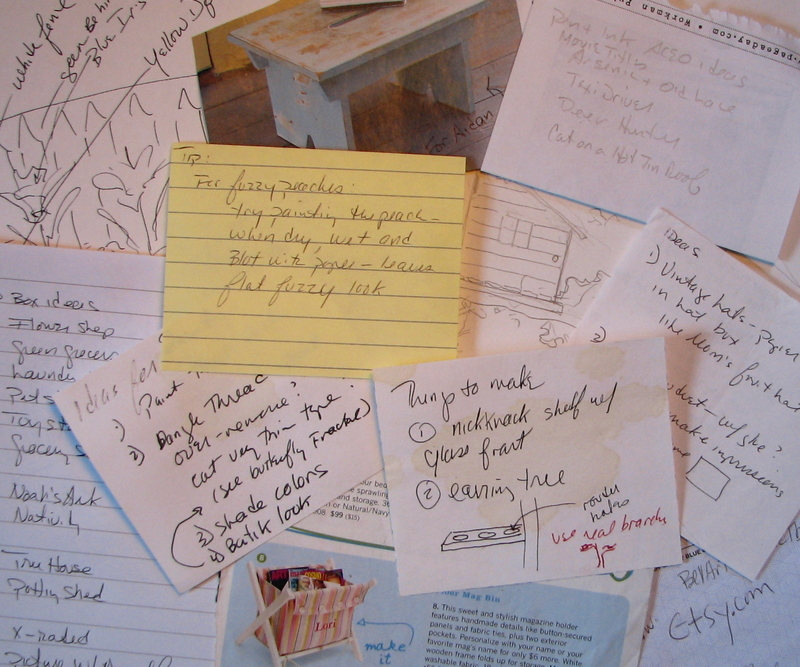 Scattered throughout were dozens of “notes to myself,” little to-do lists, ideas for things to make, design sketches, notes on how to create art effects like the fuzz on a peach. Taking inventory of one’s creative accomplishments can be very comforting, especially when one feels time is racing by and there are so many things that take us away from what we think we want to be doing. Even when your children have grown and gone and one is retired, time still races by. Myriad things pull you away from the canvas, the pen, or the camera. One child you raised has multiplied into five grandchildren you want to embrace, one apartment with a landlord who fixes things has become a small house that has no one but you to install new windows, paint the trim, and tackle the yard overgrowing with weeds. Stolen time after a nine-to-five job, cooking dinner, and household chores, has been replaced with hours of free time. If working under pressure has been your modus operandi, suddenly you are adrift in a sea of seemingly endless time and possibilities. All that you thought you were or wanted to be creatively is staring you in the face — challenging you, taunting you. So you tackle the weeds, and the house, and even take on a volunteer job, until the void is filled and once again, one is devoured by other things. The question and challenge is still the same — why do I let everything but my creativity consume me? 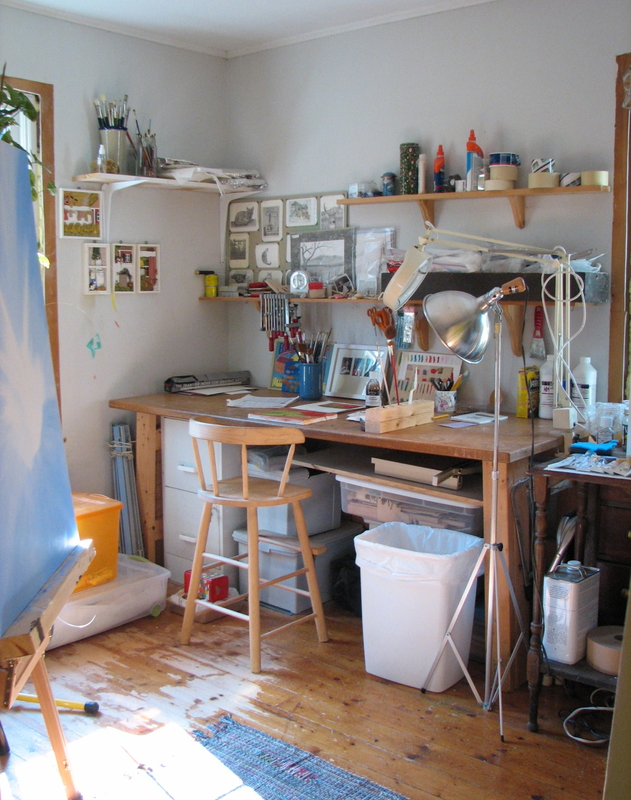 Then one day you clean off your worktable, and are faced with the undeniable fact that one has been creative — that it is the day-to-day perceptions that are off kilter. One’s focus has been on the creative imaginings of what-ifs and if-onlys. Being in the “now” — the real challenge — has been ignored. While one steals a half hour to write, one’s mind is watching the clock, already resenting the fact that one has only a brief moment. While one cuts a jigsaw puzzle, one’s mind is already wishing the next day didn’t have to be spent baby-sitting. While one under-paints three canvases, one’s mind is thinking about the workroom that hasn’t yet been cleaned up — the pile of things to file away, and how much nicer one would feel if the space were already tidy. I unburied my treasures and took note of all I’d done over the years, so many puzzles designed and made, dozens of paintings completed, shadow boxes constructed, a children’s novel written, countless inventive little gifts made, and on and on. How is it possible with all that I have created, I can still feel I have not yet found my creative self? And why do I need the list for reassurance — for confirmation? What is it that I am really seeking — to be creative, or to think myself creative? So I continue the journey. I am the age now that held all the possibilities of finally becoming who I wanted to be. And here I am, still struggling with the same old mind tricks, still searching for the truth, still my own worst enemy. But…the “now” is here as it has always been. And so, there is still hope for me. thanks, juliet, for some perspective, as i am adrift in a sea of diaper changes, laundry, nursing, etc. that place of ‘no-mind’ can be very difficult to stay put in amidst life stuff. one thing that has come up, partly as get out of the house distraction, but partly b/c of necessity, is the idea of taking a job- full or parttime – to make up the gaps in our home economy. not a fulfilling, meaningful job, but an answer phones in a salon or somesuch job. one i can leave behind when i walk out the door. but if i can bring in even 500 more a month, it would do wonders around here for getting past the just scraping by stress. it’s nice to see it laid out, that i would probably be accomplishing the same amount on the ms whether working outside the home or not. when i started this project, low so many years ago, i was working 2 parttime jobs and being a single mom with a partial day kindergartner, who was rejected by daycares. if i keep in a creative frame of mind over the whole course of the day, i can still pump out a page and keep pace with the rest of life. probably moreso with an enforced schedule in place than without. There are so many ideas here that interest me. The first is that perhaps one key to “feeling” that one is a creative person is to just relax a little bit and enjoy the moment. The huge amount of pressure that we put on ourselves seems to inevitably lead to feeling that we don’t measure up. I wonder if surveying the “list” of accomplishments is a shot in the arm? “Yes, I am seriously, impressively creative — therefore I will continue same”? Several women on this blog, myself included, have pointed out that they are LESS efficient when working with a large window of time. I still dream of having that delicious problem. Maybe Eckhart’s point is that it just doesn’t matter: do the best that you can with what you have today — breath it, live it, and stop living in yesterday and tomorrow? Perhaps it’s the dangling carrot of “maybe one day” that some of us are addicted to: the running. We can’t actually catch the carrot because the landscape would be too unfamiliar. In some ways it’s disheartening to hear that even in retirement, after years of creative productivity, there is still a large and looming question mark of self-definition. I’m really hoping I work through that in the next decade! It’s lovely to see a few comments. I do think you are probably correct, Cathy, that the part time job will not effect how creative you are. Oddly, I was more genuinely creative when I was a single mom with the full time job. Interestingly once I was out of the corporate “rat race” my urge to write evaporated – nothing to buck agains perhaps. Miranda, I’m rethinking my perspective on self-definition as I make my way through the incredible “Power of Now”. It is very powerful and transforming – changes how one sees everything. miranda … i do have time … but there is some self sabotage …. i worked for four hours today …. but i could have had six! …. i think no matter how little or how much time you can afford to give yourself for your creative endeavors, you have to feel it … sometimes you can’t feel it in the fifteen stolen minutes … or the four free hours … sometimes there can be brilliance in minute ….. and on top of that? we’re all different .. no one answer fits us all ….. my answer is that i have to get myself into my studio …. sometimes i work in it … sometimes i just hang out …. but both probably serve a purpose ….